Our social media posts has a reach of over 200,000 a month! We will provide the following services to make sure your ads will get the exposure where people will be looking. Post an ad for your business every 3 days on our social media sites. Design graphic advertisements for the posts. 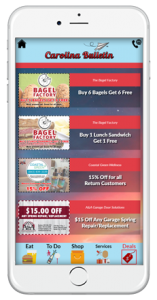 List your business, events and coupons on our mobile app. Include events and promotions for your business. questions, and collaborate with you about how to promote yourself. You would be labeled as a “Top Pick” Business!